Spinal fusion is a surgical procedure that fuses, or welds, the motion segment between two vertebra together into one solid bony block. Posterior (transforaminal) lateral interbody fusion (P/TLIF) is a technique that involves resecting the disc between two vertebra and packing the disc space with graft material from a posterior approach to create the fusion. It is a “structural” solution that is quite effective treating structural problems (scoliosis, kyphosis, instability, spondylolisthesis) but is much more controversial in the treatment of non-structural back problems (discogenic back pain, chronic back pain). There are many techniques used to fuse vertebra together (ALIF, XLIF, PLF) and the P/TLIF is one of the more common techniques, especially in younger, higher demand cases, deformity correction, or when the disc is the source of pain and requires resection. Who is a candidate for Posterior (transforaminal) Lateral Interbody Fusion? Interbody fusions have the highest fusion rates because there is a large surface are of bone exposed and it is under compressive loads (bone heals best under compression). The P/TLIF allows access to the anterior disc space through a posterior approach which avoids the risk of an additional anterior approach. Like all fusions it is used to treat structural problems that require some form of stabilization. It’s commonly used in younger or higher demand patients at higher risk for nonunion, in cases that require deformity correction such as scoliosis, kyphosis, or high grade spondylolisthesis, and when the disc is the source of pain and requires resection. It’s used primarily in the lumbar spine as the spinal cord prohibits necessary retraction in cervical and thoracic regions. Spinal instrumentation is included to provide rigid fixation and improve healing rates. What is involved in P/TLIF? The P/TLIF involves a posterior approach to the spine and disc. Laminotomy and facet and ligament resection is performed and the nerve roots retracted to expose the disc space. The disc annulus is then incised and the disc resected with curettes and rongeurs. The disc space is then packed with structural graft (or interbody implant) and graft material. Often, the remaining posterior elements are “decorticated” and this bone covered with bone graft to provide additional surface area for fusion. Spinal instrumentation is added to provide rigid fixation and promote bone healing. Figure 1: Illustration demonstrating TLIF procedure: the left facet joints have been resected providing access to the disc, which is resected. 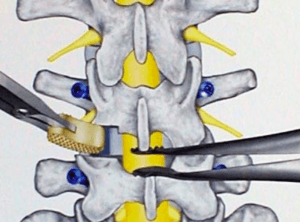 A structural bone graft is being inserted past and in front of the dural sac (yellow structure running down the length of the spine) into the disc space anteriorly. What are the pros and cons of P/TLIF? All surgical procedures have inherent risks. These include but are not limited to infection, neurologic injury, failure to heal (non union or pseudo-arthrosis), and chronic pain. Some degrees of temporary nerve irritation (numbness, tingling, even weakness) is not uncommon due to the necessary nerve retraction although permanent injury is rare. The most common risk is non-union although not all are problematic and require further treatment.